First paddle of the season, although it’s still far from spring-like. 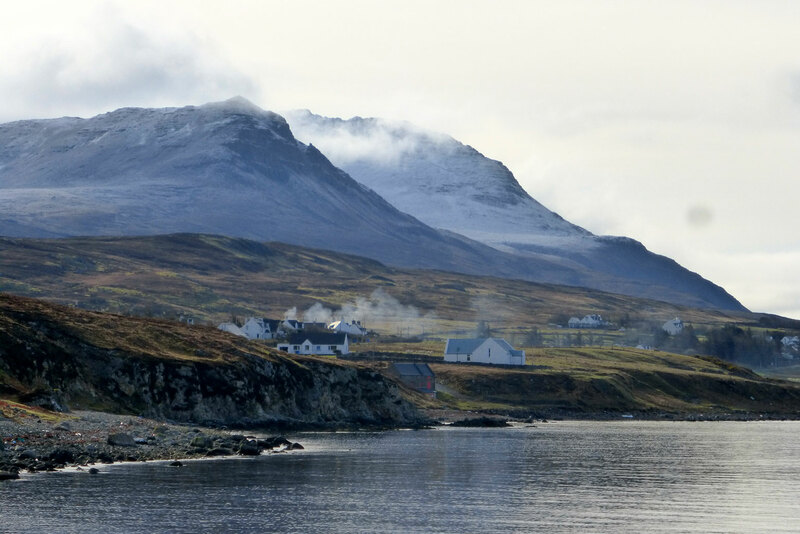 Last few days snow has been blanketing the Torridons (left), the Assynts and even BM Coigach (above). 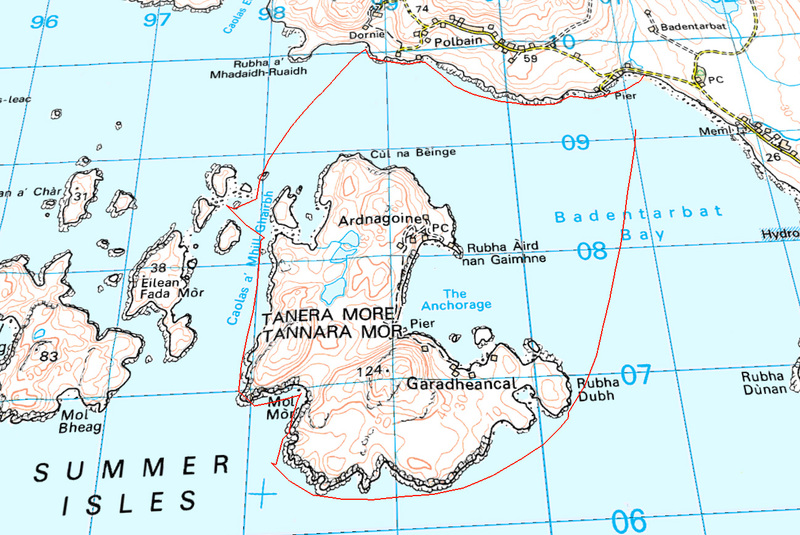 But after three days of howling, the winds abated and Jon and I went for a spin round Tanera Mor. I remember first time I did that in the new K40 it felt like an expedition. This time with two of us it was just a jaunt to get the old shoulders cranking again. Jon bought my previous IK, a Grabner Amigo, but had yet to use it, so this was a chance to compare it with my current Seawave. 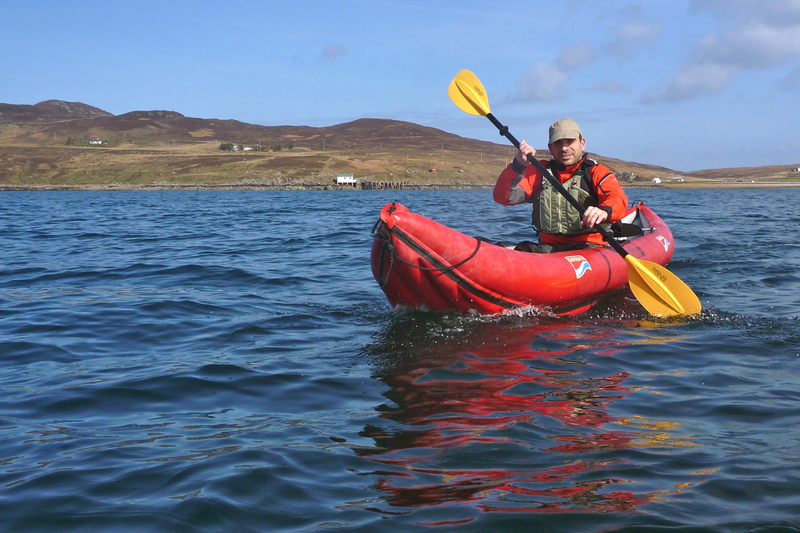 I sold the Amigo after a run out to Bottle Island when it dawned on me it literally wasn’t cut out to be a swift sea kayak. 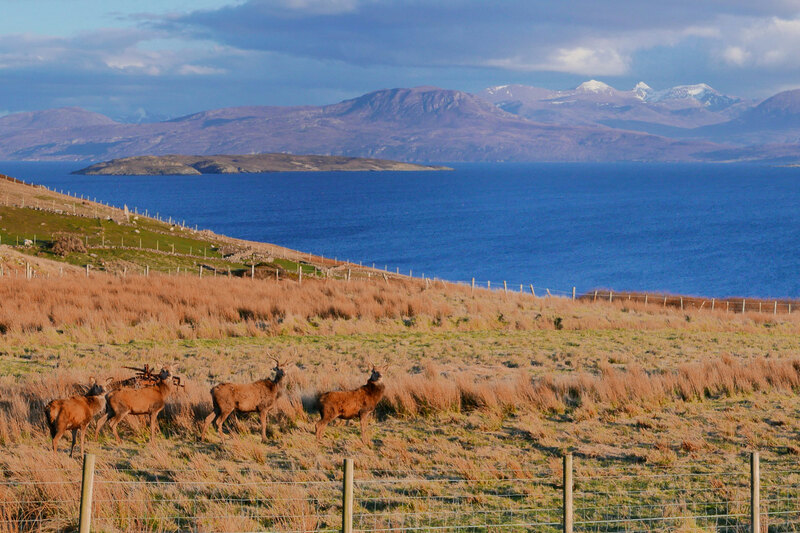 Still, I managed a pretty good tour of the Slate Islands that year with the Amigo. 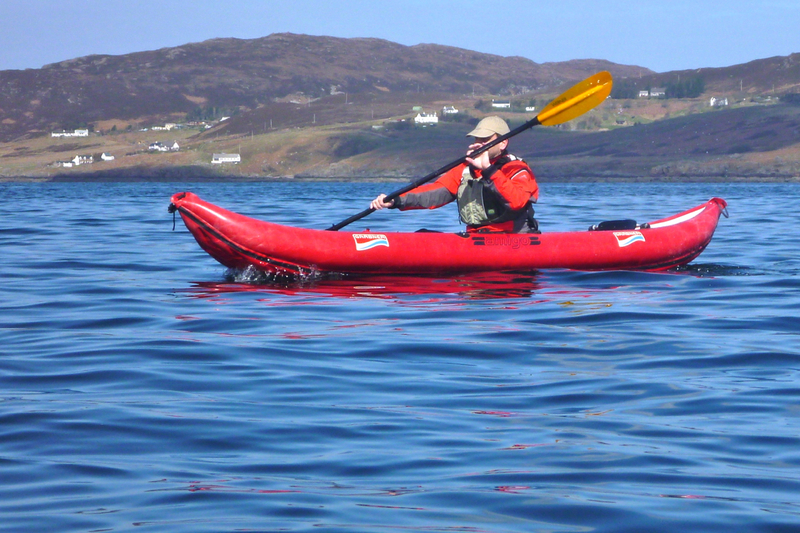 Off Badentarbet beach heading for Rubha Dubh-Dubh, Jon was notably slower in the Grabner. For a moment I felt a bit bad – Jeez, did I really sell him such a dud? I’m sure it wasn’t that bad. It was only later when we swapped boats and were more of less evenly matched, that it transpired years of paddling slick, hydro-dynamically efficient hardshells had had a catastrophic effect on Jon’s pulling power. 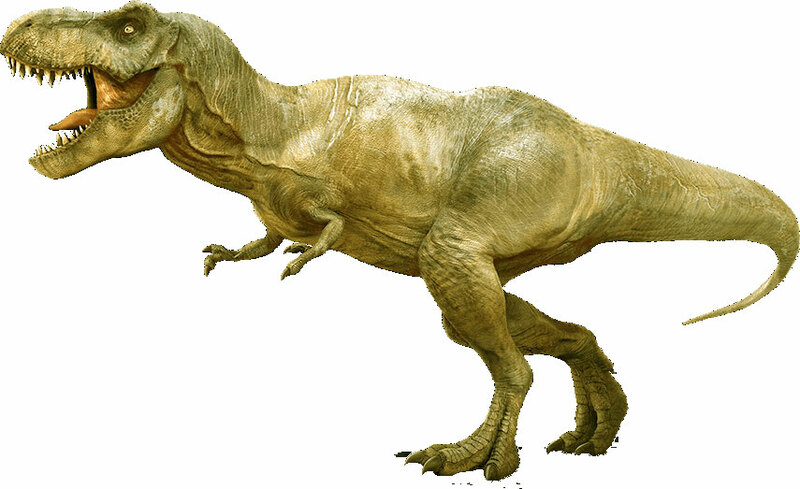 Either that, or a winter’s pushbike training had similarly atrophied his arms, giving him the physique of a T Rex. Still, it was good to break the arms in gently, and before we knew it we were turning back northwest for the Tabera channel. 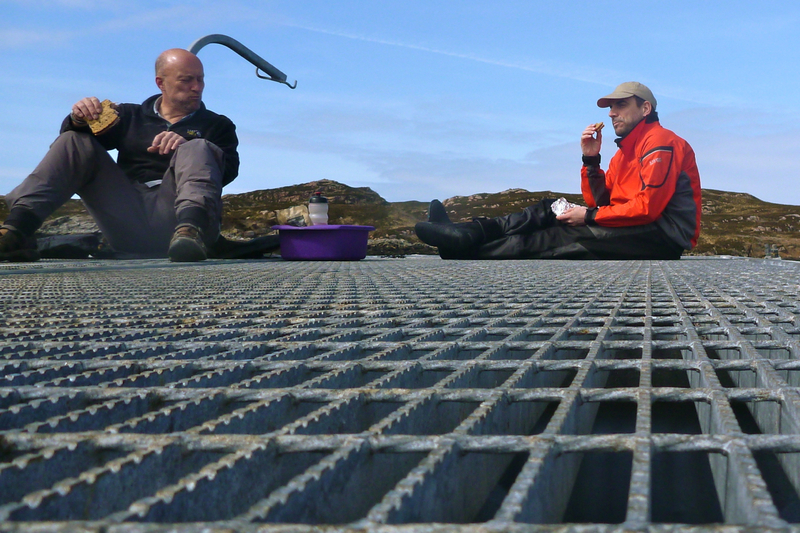 With the tide bottomed out, we had lunch on a fish farm platform to the sound of salmon skimming and thrashing up non-existent rapids to their blue remembered breeding grounds. With that sort of daily exercise, at least they won’t end up like T Rexes. From here I rowed the Amigo back. Sure, the flat nose was more snow plough than arrow-like bow, but you’ve got to admire the Grabner’s solid, no-nonsense build. PRVs? Kiss mein schkegg! Proper seat and attachment points? Opzional, Freund. And compared to the slight flex I noticed in the Seawave – even at .25 bar all round – the 0.3 bar and 750-cm shorter Amigo was as stiff as a stretcher. 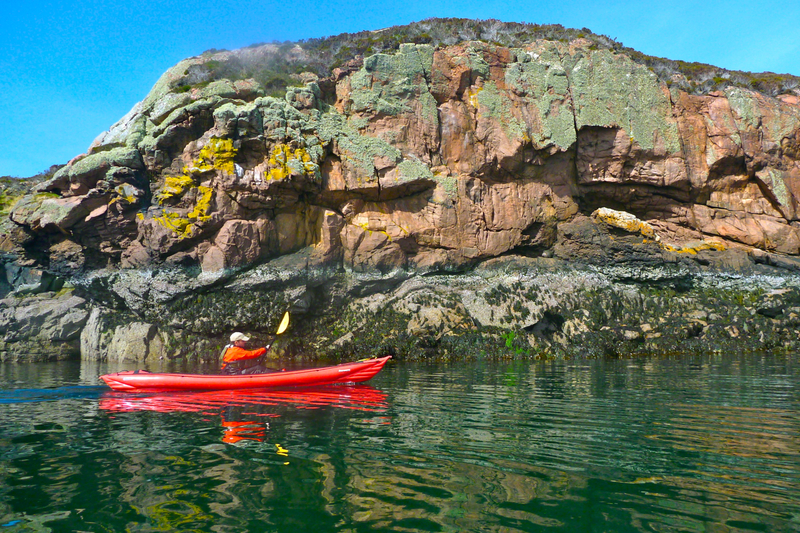 As before, the seat-bar mounts caught my fingers as I paddled, but Jon found similar protuberances on the Gumboat. 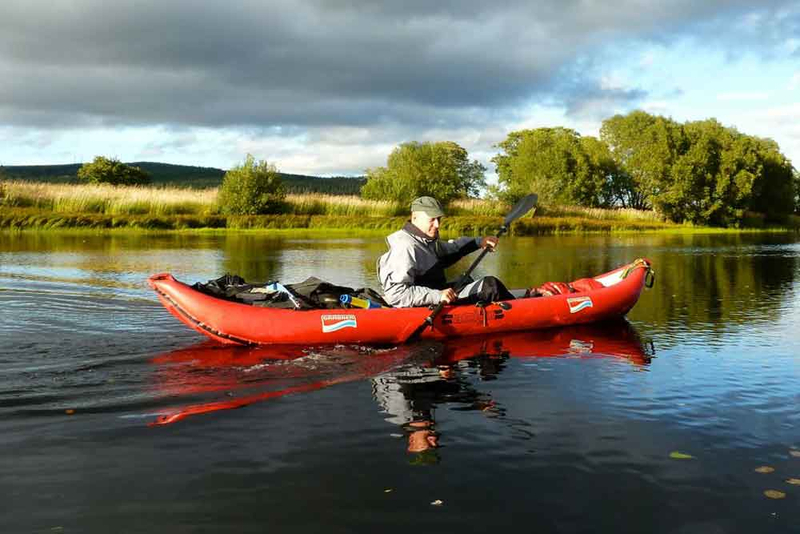 The bomb-proof Amigo would make a great river touring boat: tough as nails, upswept ends to ride over whitewater and as stable as any IK – though the upswept stern might be a backwind catcher when running skeg-free, as I did on the shallow Spey one time (left). All in all though, living as I occasionally do by better sea than big, boaty rivers, the Seawave works for me, even at just half an mph faster. The price new was about the same, but there were a lot more extras with the Gumotex, including a deck (I never use). 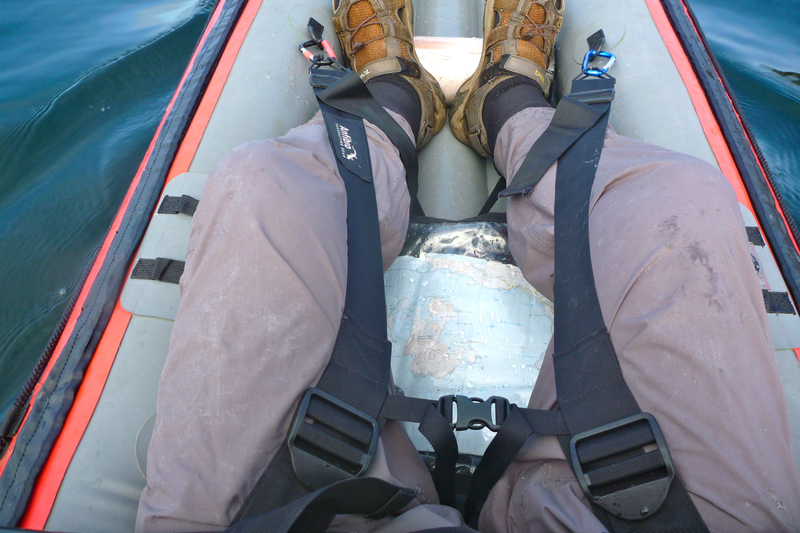 I gave the OE seats away with the Amigo and made a lightweight and q/d seating arrangement which I’ve adopted on the Seawave: a packraft seat base, SoT backrest plus packraft thigh straps and my patented elasto-cantilevered drainpipe footrest (right). Read all about them here. 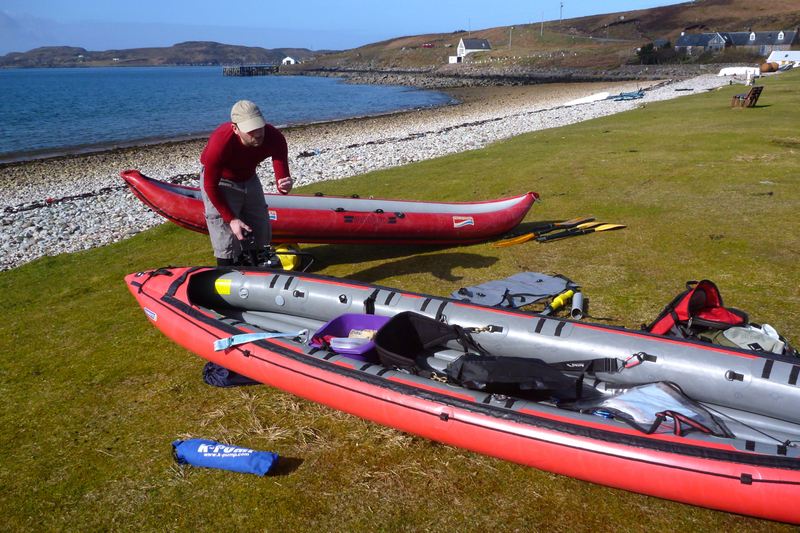 This entry was posted in Gumotex Seawave, Inflatable Kayaks, Scotland, Summer Isles, Travel Reports. Bookmark the permalink.